I’m Peter Allen, a professor of Chemistry at the University of Idaho. I use DNA nanotechnology to build tiny things like autonomous nanomachines. DNA is more than genes and heredity. When I tell people that I work with DNA, they often ask me what species I got my DNA from. I didn’t get my DNA from any living creature. I invented the sequence. I synthesized the molecule. It doesn’t correspond to a gene or to heredity or to biology at all. The DNA I made is just a chemical. It has interesting chemical properties like no other molecule. As a chemical, DNA has rules that I can understand. With a few exceptions, DNA has four components that bind together in a specific pattern: adenosine (A) binds to thymidine (T); guanine (G) binds to cytosine (C). Synthetic DNA can be made that has any sequence of these components. When DNA is synthesized, it only has half of the double helix. A piece of DNA can be made with a sequence like AATGC. That piece of DNA wants to bind to another piece of DNA with the reverse-complement sequence, GCATT. When they bind together, they make the spiral we’re all familiar with. With that simple rule set, people have built some amazing and complex things. People have folded DNA into 2D and 3D shapes. People have used DNA to manipulate light. Remarkable reactions including catalysts and amplifiers have been built using these base pairing rules. I am particularly inspired by the work of Yin et al. I adapted the Yin designs to make a DNA nanomachine that walked around on microscopic particles. As they walked, they created a signal I could see with my eyes. This technological field is evolving like Linux does: through the sharing of code. I think that’s weird. DNA is the physical embodiment of biological evolution, but this synthetic DNA is evolving in our brains and computers. Building a structure by hand is too hard, so software is used to design the DNA interactions that will create a structure. That software is often open source. That software also evolves in the same way that Linux distributions evolve. DNA nanotechnology is a strange mix of literal evolution and digital/social evolution. The open source software used to create DNA origami (like CADnano) presumably will evolve like Linux. If you look at the Linux timeline, it looks like a phylogenetic tree. This is more than a passing resemblance: Linux has almost literally evolved. Linux is an open source operating system. Anyone can change the code. Programmers make changes in their personal copy. That’s like a mutation. If those changes are good, they might be adopted by the official community or added to the “distribution” (a shared package of official code). That’s selection and reproduction. Sometimes, a change is very radical. The community splits and creates a second distribution entirely which then evolves separately. That’s speciation. This process of gradual change with occasional splits in the lineage (and occasional extinctions) is the same kind of process that creates phylogenetic trees in nature. DNA nanotechnology software evolution will depend on the kinds of rules we discover. If we can inform this software with new data, maybe we can help this software do more. DNA, by itself, can make some interesting structures aside from the double helix. 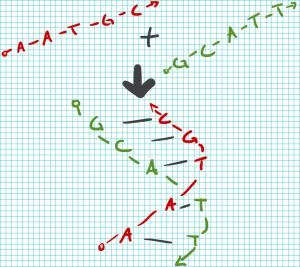 For instance, DNA can make a folded “quadruplex” structure if it has enough G’s in the sequence. But what about DNA when it is mixed with other things like proteins? Aptamers are DNA that has evolved to bind a target molecule like a protein. By repeatedly amplifying and collecting DNA that binds to some target molecule (and removing non-binding DNA), one can select strong binders. Aptamers are like synthetic antibodies. Aptamers can be used for all kinds of things. If a scientist or physician needs to determine if a specific biomolecule is present, it can be detected with an aptamer. This can be especially powerful when combined with DNA nanotechnology. Some enterprising folks even took aptamer binding and used it to create a signal that could be amplified using DNA circuits. How will DNA design software evolve to incorporate aptamer binding? I suspect that there are patterns in aptamer sequences. I suspect that there are rules for what kinds of sequences aptamers come from. One of the projects we are working on in the Allen lab is to get deep sequence information from aptamer selections. Maybe with that data in hand, we can start to tease out some new rules and artificial selection and evolution can inform digital evolution. This entry was posted in BEACON Researchers at Work and tagged BEACON Researchers at Work, Biological Evolution, Digital Evolution, genetics. Bookmark the permalink.